Compared to what the city has gone through in its battles with pro sports teams, the presumptive fix at Seattle Center is a jaw-dropper. Every time the project builders step up to a microphone, the price goes up. 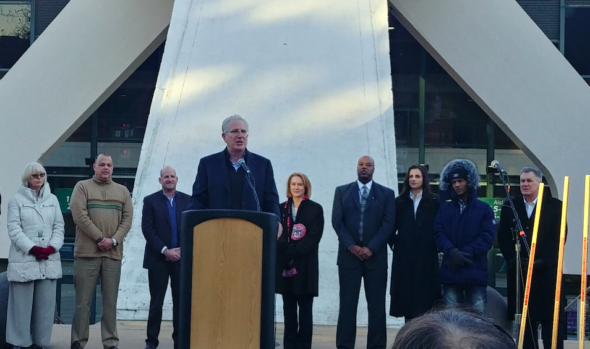 Wednesday at the ground-breaking ceremony for the new Seattle Center arena, NHL Hockey Partners CEO Tod Leiweke said the latest arena-only estimated cost was $850 million. Over the weekend, he said it was $800 million. Perhaps the mics are giving off laughing gas. Because at the groundbreaking ceremony Wednesday afternoon at KeyArena’s West Plaza, Oak View Group CEO Tim Leiweke almost gleefully reported good economic news for Gov. Jay Inslee, who had just jumped on the bandwagon with a brief whoopee speech. “Governor, it’s $1.6 billion and counting, to the state of Washington,” he said, adding in the $650 million franchise fee (which actually goes to the NHL), and the $70 million cost cost of new training facility at Northgate Mall. “We’re proud of the fact we’re doing this without the taxpayers having to pay for it. The well, it would seem, is bottomless. But even though it’s obvious, a fundamental notion bears repeating at this juncture after the green light was given Tuesday by the NHL for an expansion franchise launching in 2021. We — taxpayers of the city, county and state — don’t have to care about costs. By covenant between the publics and the privates, it’s not our problem. In the history of sports venues and Seattle, it is a milestone. One way to appreciate it is to compare the history of the four modern-era sports palaces for their differences. The Kingdome (opened 1976) and Coliseum/KeyArena (1967/1995) were general purpose public buildings created on spec with 100 percent borrowed public money, before teams were acquired. They worked as do inexpensive, sensible shoes, but became worn and obsolete before the bill was paid. Safeco Field (1999) and the Clink (2002) were sport-specific buildings, funded primarily, but not totally, by public funds for existing teams that had a stake in long-term positive operations. Both have been financial and esthetic successes. They are Gucci footwear. The demolition, construction and operation of the new arena at Seattle Center is entirely free of the budget scrutiny that comes with use of municipal funds. The billionaire funders have the wherewithal to manage the crises, spend for gaudiest hood ornaments and charge for entry whatever the market will bear, free of tax-money guilt. They are incentivized to do it right because the debt service demands a maximum revenue stream. For my 2002 book Out of Left Field on the Mariners’ business success, I interviewed a construction expert who inspected the Kingdome’s concrete roof before the the peak was finished, exposing a cross-section view. He said he was so shocked at the thin depth of the concrete that he momentarily feared for his safety. Eighteen years later, water seeping through the thin concrete caused wooden ceiling tiles to fail before the start of a Mariners game. Municipal governments have no business in the entertainment business. I understand that politicians love to leave physical legacies of their tenures. I also understand that in 2018 when the top one percent is wealthier than at any time in the history of modern civilization, private solutions must prevail over ego. But in the current project, the building and grounds remain public, and the arena remains the only one in pro sports situated in a public park. So there remains a public interest to protect. Jenny Durkan is a life-long Seattleite and easily the most learned sports fan among the couple of dozen mayors the town has had over the past few years. That means she has lived through 40-some years of argle-bargle between pro sports teams and the governments that must deal with the extortions of industry’s monopoly operators, and watched the Pilots and Sonics leave town. She is also an accomplished trial lawyer and was appointed by President Obama in 2009 to be U.S. attorney for Western Washington, serving until 2014. Her history is useful when considering whether the public might still be hosed by potentially nefarious details in the many legal documents that define the relationship between the city and Oak View Group. “I have a background in tough negotiations,” she said in a brief interview after the ceremony. “I understand it’s not personal. People have business goals, and you recognize what those are, then you figure out how to get to yes. What I appreciate about the Leiwekes is they’re all about how to get to yes. “What I like about Tim is when we get together, we’re completely frank with one another — strengths, weaknesses, what we need to do get things done. It was tough negotiations, make no mistake about it — the city had really important interests here. We met the Leiwekes. We talked. They delivered. In the history of the business of Seattle sports, it is an historic breakthrough. Even if the expense meter looks like a gas pump. Wonder if they’ll have their own stadium to play in , financed by the owners ? What ever happened to that women’s league .. the “Lingere League” or whatever ? Maybe they could play on their old field ! XFL will play at the Clink. The lingerie football league plays only in your memories. Actually, the Seattle Mist plays in the ShoWare Center in Kent. Art, how on earth does this pencil out from a dollars and cents standpoint? $850 million for the arena? $650 million buyin for the team owners along with $70 million for the Northgate practice facility; let alone the basic cost of operating a team/organization. How do all these folks figure they are going to get a payback? I feel like this isn’t sustainable. here’s a guess: the $650 million payment to the NHL is a bet on the rising equity value of NHL teams. these equity value increases are driven by their monopoly status, and their value as real-time entertainment, which means viewers will watch the ads, rather than recording them and fast-forwarding. the other $850 million tranche, the one ticking up like Art’s proverbial gas pump, will be recouped in NHL ticket prices (I’m guessing those prices will cause a fair few jaws to drop), and lots of foot traffic volume via concerts mostly, and whatever else will draw the punters in. that’s just a guess. Every franchise in sports has equity appreciation because of monopoly status. Concerts are the driver for the project. Lots of big indoor acts skip Seattle-Tacoma because the market lacks the arena to stage them. It is hard to imagine. Oak View Group hasn’t shared its revenue streams. What is known is this will be a top-tier hall for music tours, which are more lucrative and frequent than the 40-plus hockey games. Expect close to 300 bookings annually. How many farewell tours can the Eagles play? Some easy research on the tax cuts applied to our masters reveals much. It’s not hockey related, but for example, Sheldon Adelson’s company recorded a income tax windfall from the GOP tax law. Our tax cuts down here on planet earth resemble a few crumbs and also have expiration dates written right in, while our superiors . . . . The Kingdome wasn’t a complete failure in engineering. After all it rode through the Nisqually earthquake with barely a scratch when Ken Behring claimed a small earthquake could bring it down. I’m no engineer but I’ve never understood the purpose of the wooden tiles. Interesting comments by Jenny Durkan saying that the Leiwekes are about saying yes and getting there. Is that a shot at Chris Hansen? I wonder if he or his group have met her yet? Me too. Great memories, always a cheap seat and no place louder. Except maybe the Seattle Center Coliseum!